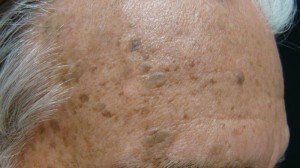 Seborrheic keratoses are noncancerous skin growths that more commonly affects the elderly but can also be seen at any age. Its exact causes are unknown, although it tends to be hereditary. Younger persons with seborrheic keratoses often have a positive family history for such growths in their parents or grandparents. Seborrheic keratosis is often a painless condition that requires no treatment;, however these growths may become irritated, inflamed and even bleed, when rubbing against clothes, bra strap, cut shaving, etc. Other patients often choose to have these growths removed for cosmetic purposes. Dr. Kaminester commonly removes these growths every day with minimal or no scar! Ask to see Dr. Kaminester’s “before” and “after” photos of his patients who have had their seborrheic keratoses expertly removed by him. 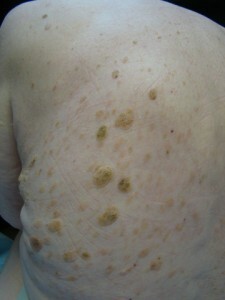 A seborrheic keratosis can appear anywhere on the body but may be more common on the head, neck, or trunk. It is usually round or oval shaped, and it may vary in color. Medical attention may be necessary if numerous seborrheic keratoses develop in a short period of time, the seborrheic keratoses interfere with clothing or other abnormal skin changes occur. These growths may appear one or more than one at a time. Although they are typically small with a maximum size of an inch or so, they can grow to several inches wide and very thick and rough surfaced; they may cause some discomfort depending upon where they are located. If your clothing rubs against and irritates it or you scratch it, the seborrheic keratosis may begin bleeding and could potentially become infected. 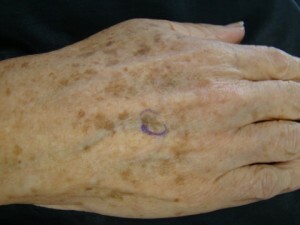 A seborrheic keratosis is diagnosed by inspecting the affected area. A biopsy is usually not necessary but on occasion may be taken to rule out skin cancer. Seborrheic keratoses require no treatment, but many patients who have them decide to visit Dr. Kaminester for help with them! If removal is requested for cosmetic purposes, it may be achieved through cryosurgery (use of liquid nitrogen), curettage, or superficial shave excision.